Let me start off by explaining what the Slice of Life genre is for those of you who are unfamiliar with it. Basically, it is when a show takes a cross-section of a character's life, and that is its entire purpose. There is no quest to save the world; no ultimate battle between good and evil; no grand mystery to solve. Some of those elements may be present in some form or another, but they are not the focus of the show. The Slice of Life genre exists simply to let us see the ordinary life of its characters. Most shows in this genre end up being teen romances set in high school (Clannad, Toradora, etc. ), but there are almost as many that aren't romances at all (K-On!, Tari Tari, etc.). Because of the audience they are targeting, they do tend to be almost exclusively set in high school though. The two shows covered below aren't your typical Slice of Life shows though. They're very different from each other, but they're both examples of one of the things that I like the most about anime: whoever made them had guts. Where else but an anime could you find a show about competitive poetry? 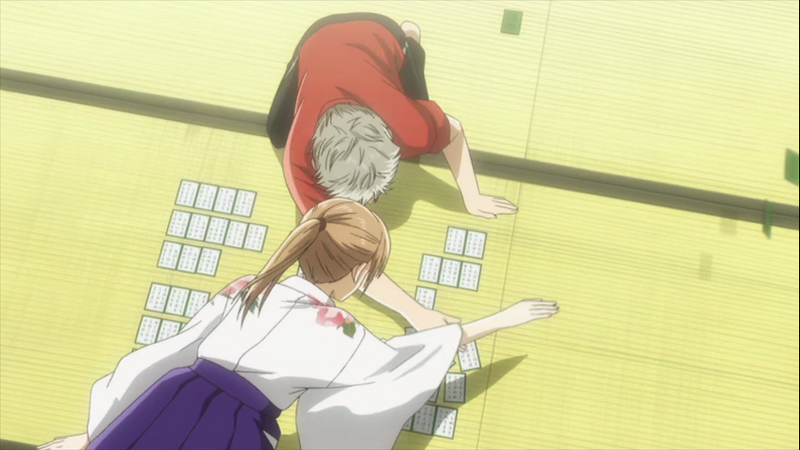 Chihayafuru is about a girl who loves the sport of Karuta. It's a bit of a stretch to call this show a Slice of Life anime because it's really a sports show, but it's close enough for my purposes. Chihaya Ayase fell in love with the game of Karuta in elementary school, and now that she is in high school, she wants to start a Karuta club so she can play for the school. The show is about her and her two friends from elementary school, as well as her new friends in the high school Karuta club. 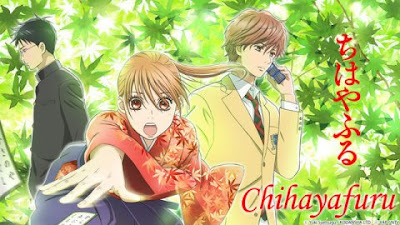 The main characters: Arata, Chihaya, and Taichi. That's what I say, but really the show is about Karuta. Karuta is a two player game about the Hundred Poets. Around the year 1200, the poet Fujiwara no Teika compiled several poems from the history of Japan into a collection called One Hundred Poets, One Poem Each. Each poem has the same technical structure, which is used in Karuta. The poems can all be split into two halves. Each player is given 25 cards with only the second half of one of the poems, while another person (the reader) is given 100 cards with the entire poem on them. The players place their cards in front of themselves, while the reader selects cards at random and reads them. The goal of the players is to get rid of all 25 of their cards by being the first one to touch the correct second verse of the poem that is currently being read. Check out the Wikipedia article on Karuta for more detailed info. This is basically what Karuta looks like. Apparently. Anyhow, that doesn't sound very exciting, does it? Honestly, it sounds like a terrible idea for a TV show. And yet, somehow, it is one of the most exciting shows I've seen. The matches are riveting to watch, the poems are beautiful to listen to (even if I can't understand them), and the characters are so much fun to watch grow. If you ever want to appreciate poetry, watch this show. One of the characters doesn't like Karuta all that much, but she loves the Hundred Poets. Many times she talks about the meaning behind one or two of the poems; who wrote them, what they were feeling when they wrote them, why they are so sad or so happy. There is so much depth to them, and somehow a TV show has managed to convey that meaning in a way that actually makes people interested. After the anime premiered, Karuta participation noticeably increased. That's cool. It's currently airing its second season right now, and it's just as good as the first so far. 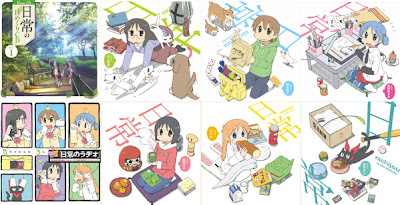 The other show, Nichijou, is definitely a Slice of Life. It has no plot or purpose to speak of: it's just about this group of friends in high school. The twist that sets it apart from other shows is that it's flipping nuts. I honestly have no idea how they convinced the producers to let them make this show, because there is now way that it should exist. If it had been conceived in America, there's now way that it would have even made it far enough to get cancelled by Fox. Nano, The Professor, and Sakamoto. 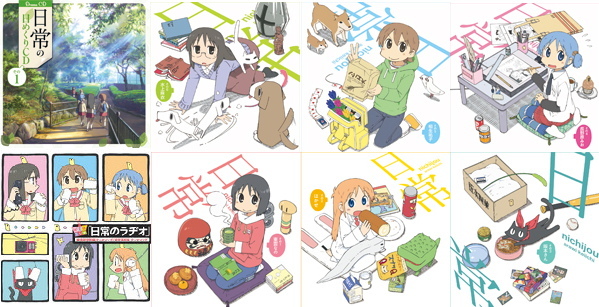 Everything in Nichijou is exaggerated beyond belief. I'll try to give a brief explanation, but don't blame me if you get confused. At the start of the show, there are two groups of friends who eventually combine by the end. One group consists of three high school freshman girls: the one with ADD, the one in love with the boy who rids a goat to school, and the one without emotions. The other group consists of an 8 year old professor, the android that she created who only wants to be a normal girl, and their talking cat. The cat can only talk because the professor made him a scarf that lets him talk. SCIENCE! That may not sound that strange for an anime, and I suppose that it really isn't, but the rest of the show is just as insane. The android has a wind-up key on her back whose only purpose is to launch her big toe like a missile, revealing a USB plug. Two characters who run around a corner and accidentally crash into each other cause a thermonuclear explosion. There is a club at the school that combines the game of Go and soccer...somehow. The best part is that the show plays all of these jokes completely straight. The professor installed the rocket in the toe because she thinks it's "cute." One of the characters in the explosion wakes up afterwards on a roof and can't figure out how to get down. It turns out that one of the teachers at the school was a professional Gosoccer player back in the day. 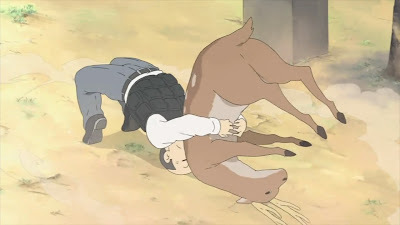 Why yes, that is the principal doing a German Suplex on a deer. The style of humour for the show is definitely reliant on randomness, so it's no wonder that I find it hilarious. It's definitely not for everyone, but it's right up my alley. After all, if the show's name is literally translated, it is My Ordinary Life. Why wouldn't it be insane? Check back tomorrow, when I'll be covering a show about Japanese Folklore that showed me I don't need a show to be serialized to enjoy it.